Garlock MULTI-SWELL 3760-U (NSF 61 Certified*) Aramid fibers with a proprietary rubber binder. A compressed non-asbestos gasket sheet of aramid fibers with a proprietary rubber binder that seals where standard gaskets won't. For aliphatic hydrocarbons service (lubricating oils, fuels, solvents, etc.) and water. Garlock MULTI-SWELL™ Gasketing provides an ultra-tight seal in water and oil applications. MULTI-SWELL™ Gasketing is a specially formulated gasketing material that is designed to swell when in contact with aliphatic hydrocarbons (petroleum oils, fuels, solvents, etc.) as well as water. The swelling allows the gasket to conform to the flange faces even though the bolt load is insufficient to compress a traditional fiber gasketing material. Proprietary formulation creates additional gasket load when the gasket comes in contact with oil or water. 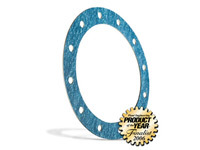 Twice as compressible as standard fiber gaskets - conforms to irregular surfaces. MULTI-SWELL™ Gasketing stops leaks in gearboxes, compressors, pumps, lube oil systems, and access covers.